Mar. 7, 2016 8:00 a.m.
Surrey is the top destination where government-assisted Syrian refugees are finding permanent homes in B.C. Nearly 300 or close to half of the just over 600 government-assisted Syrians that have found permanent accommodation are in Surrey, said Chris Friesen, settlement services director of the Immigrant Services Society of B.C. Coquitlam accounted for about 20 per cent of permanent refugee homes, followed by Burnaby, Vancouver and Delta. But more than 900 government-assisted Syrians were still in hotels waiting to move into permanent homes, including more than 160 in Abbotsford, as of Feb. 29. Friesen said some of them have begun to be transferred to cities outside the Lower Mainland, including Victoria and Nanaimo, with more destined for centres like Prince George, Kelowna, Vernon and Kamloops starting this week. The hope is permanent housing will be easier to find in those centres than the high-priced Metro Vancouver area. “As we predicted, we’re dealing with larger size families – larger even than we thought,” Friesen said, adding that means large suites or homes are needed. “The ongoing challenge for us remains permanent housing,” he said, adding language training and jobs are the next top priorities. The government assistance in place for one year provides a family of six with a maximum of $885 a month for accommodation – much less than the typical rent for a large home. Families of three or more also get $649 a month for food and clothing under the federal Resettlement Assistance Program and a one-time start-up allowance of $1,709. The food and clothing allowance is fixed whether it’s a family of three or 10. “The Syrian men are very anxious to get into employment but they don’t speak English. So we’ve got to work through that,” Friesen said. ISS of B.C. has 14 volunteers working to identify housing and other assistance and the refugee wave is like nothing they’ve seen in recent years, particularly when it comes to big families. The number of Syrian families arriving over the past 10 weeks with six or more family members has now surpassed the number of assisted refugee families of that size of all nationalities that arrived over the previous six years since 2010. 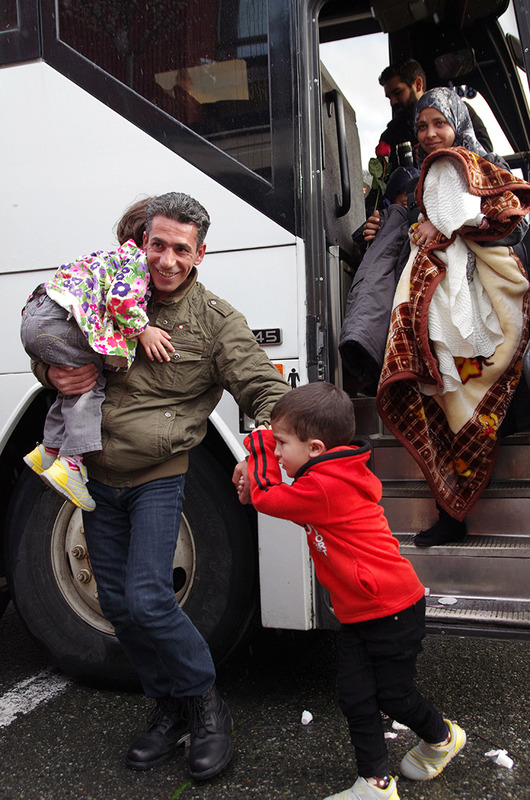 A total of 1,541 Syrian government-assisted refugees in 343 families had arrived in B.C. as of the end of February. Those numbers don’t include additional privately sponsored refugees. Canada declared it had met its interim target of resettling 25,000 Syrian refugees by the end of February. But Friesen noted still more Syrian refugees are expected to come to B.C. in the months ahead. He predicted another 1,600 government-assisted Syrian refugees were likely to enter the province by the end of the year, plus up to 900 non-Syrians.